Share the post "Uterine Fibroid Re-growth After Embolization"
Have questions about fibroid recurrence? Read up on how UFE tops more traditional surgical methods when it comes to booting out the possibility of fibroid re-growth. This spring I was diagnosed with an extremely enlarged uterus & several large fibroids. I have always had very heavy, long cycles which, lucky me, have included blood clots, extreme cramping, bloating, backaches. My doctor has said she recommends a hysterectomy, but I’m not sure I want that. Do fibroids return with the embolization procedure? I did read there were 3 kinds of fibroids, does the procedure only work for one kind or is it effective on all fibroids? Recurrence after embolization is minimal. 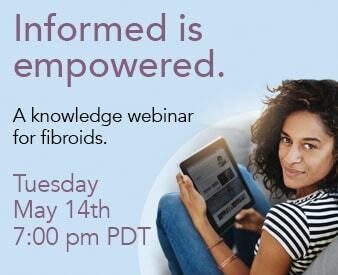 Fibroids have a possibility of growing back up to only 10% of the time after UFE and if so, they grow back several years after the surgery. Research has proven UFE to be very effective with a very low rate of recurrence, compared to the higher rates of recurrence by more traditional methods, and therefore can be seen as an optimal choice of fibroid removal. Additionally, it is possible for some patients who continue to have menstrual cycles after UFE to develop new fibroids, some of which can cause symptoms. This is not surprising as all of a woman’s reproductive organs are intact after UAE. Fortunately, however, this problem is rare and can easily be managed by repeat UFE. In regard to UFE’s capabilities in terms of treating fibroids in submucosal, subserosal, and intramural areas, the procedure has been used to treat all types of fibroids and is not limited to the location of the fibroid. If you have any additional questions or are looking into having the procedure done, please feel free to call the Fibroid Treatment Collective at 866-362-6463. They will be happy to answer any of your questions!